This is the very best recipe for City Chicken! City Chicken, (also known as mock chicken), is not actually chicken at all. It's a regional dish that is made from pork sirloin cubes (or sometimes a combination of pork and veal) that have been thread onto skewers, browned, then slow braised. It's one of my very favorite Cleveland comfort foods of all time! 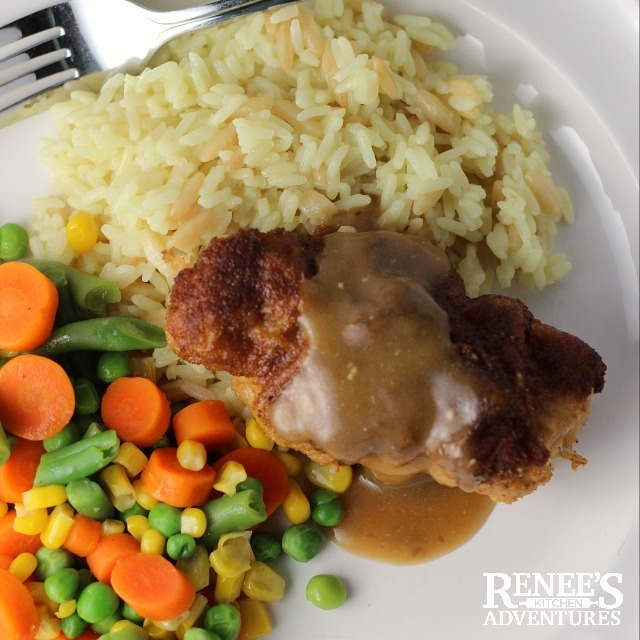 This City Chicken recipe with gravy will quickly become your new favorite and have your family asking for that city chicken recipe that isn't chicken for dinner! What is City Chicken and how do you cook it? According to Wikipedia city chicken, also known in some locations as mock drumsticks or mock chicken, is an entrée consisting of cubes of meat (usually pork), which have been threaded onto a wooden skewer (about 4-5 inches long), breaded, and then fried and/or baked. The city chicken recipe origins date back to the 1700's when raising chickens in the populated cities became impossible. Inexpensive cuts of pork skewered on sticks to resemble chicken drumsticks became a substitute for chicken as a meal. Over the years, city chicken recipes have included other cuts of meat as well, such as veal or beef...but living here in Cleveland, I've always made my city chicken recipe with only pork, and that is how I like it! Where can you find pork for City Chicken? I buy pork sirloin already cut for city chicken with the skewers included in the package. They are sold packaged this way in most of the grocers in the Cleveland area. If you don't have pre-cut pork for your city chicken recipe available to you, you can buy pork sirloin or loin and cut it into 1" cubes yourself then use shortened bamboo skewers to thread it on to. The best way to cook city chicken is low and slow in the oven until it is fork tender. It really is the secret to great city chicken! How do you cook city chicken in the oven? 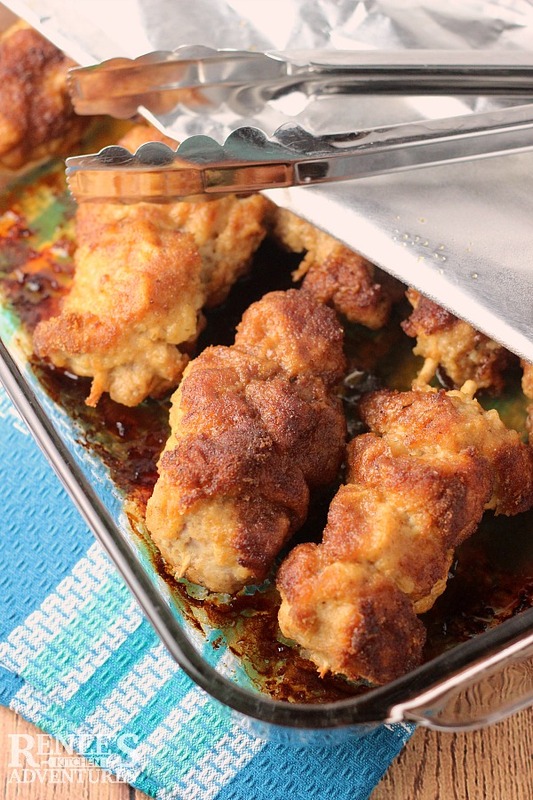 To make this city chicken recipe, start by threading pork cubes onto the skewers. Next bread them them with a three step process. For this city chicken recipe that means dredging the pork in seasoned flour, followed by egg beaters or egg wash, and lastly Italian seasoned dry bread crumbs. I like to add some smoked paprika to the dry bread crumbs, as well as a little extra salt and pepper. Once the city chicken pieces have all been browned and placed into the baking dish, I add a little chicken stock to the bottom of the pan and cover tightly with foil. I then bake in a 325 degree F oven for 1 1/2 to 2 hours, or until the pork is fork tender. I like to serve my city chicken with gravy and mashed potatoes. 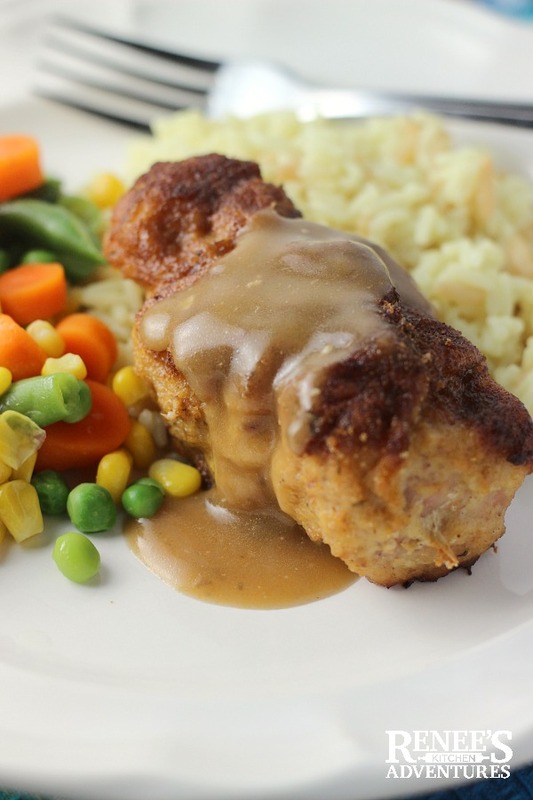 My gravy is simply a mixture of canned pork and mushroom gravy...because that's what we like! There's really nothing fancy about good old City Chicken... it's just great comfort food. Does City Chicken taste like chicken? My family swears that this city chicken recipe really does taste like chicken drumsticks (hence the nickname, mock drumsticks!). Me, I'm not so sure. One thing for sure is that this city chicken recipe is delicious and a definite keeper! Make it, taste it, and you be the judge! Want to learn more about pork and where it comes from? Check out this article about my visit to an Ohio Hog Farm! Hungry for more of Cleveland's favorite recipes? Try my recipe for the iconic Polish Boy Sandwich! In this city chicken recipe, pork sirloin cubes are threaded onto skewers, breaded, browned and slow braised until fork tender. Then, served with gravy. Set up a breading station. Seasoned flour, eggbeaters, and then the breadcrumbs. Add the smoked paprika to the breadcrumbs if using. Thread 4 cubes of pork onto each skewer. Dust first with flour, shaking off excess, then dip each skewer into the eggbeaters, followed by the breadcrumbs. Heat a nonstick pan over med high heat with 1 TBS oil of your choice. Brown the breaded pork on all sides. You aren't looking to cook the pork, just get a nice brown. Once the pork is browned, transfer to the prepared baking dish. Leave a little space between each skewer. Pour chicken stock into the bottom of the pan and cover tightly with foil. Bake in 325 degree oven for 1 1/2 to 2 hours, or until pork is fork tender. Serve with heated gravy. 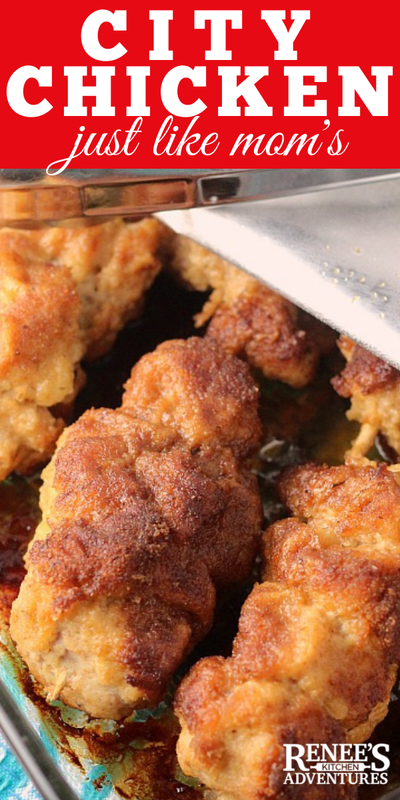 Pin City Chicken to your Pinterest Boards! I have not had it or heard of it. My husband's family is from the midwest, I will have to ask if they have had it! It looks tasty. I just love it....but it is very regional. Mostly around the Great Lakes region of the midwest. You will have to let me know if he has ever had it! I've never heard of city chicken! I love this :) I've been meaning to pan-fry something for a while now and this looks totally interesting. My brother has been craving mashed potatoes lol! I've never heard of such a thing! but the outcome looks so yummy! I confess I only eat things like hay, grain and Peanuts. But the Goatmother is from Oklahoma and she has never had this. She says it looks awfully yummy though. Thanks for sharing! I've never heard of city chicken either and I grew up in the midwest - weird! That being said - it looks delicious - definitely putting this on the menu - soon! This looks so good - I am also from the midwest, and never have heard of it! It makes sense that people would want their chicken, and no room to raise them. Very cool! Love your pictures! Nope - I've never had that before, but it looks great! And the calories aren't that bad either! No, I've never even heard of it but I loved hearing the back story on it. I just bought a pork tenderloin but have a busy day tomorrow so I might have to surrender it to the crockpot. If I can swing it, I'm so making this with my breadless breading! Woot! I'm so glad you could experience your heritage through this recipe. I'll have to give the cracker crumbs a try sometime! I've never heard of city chicken and I grew up in the midwest, but I love it! My family would love this! 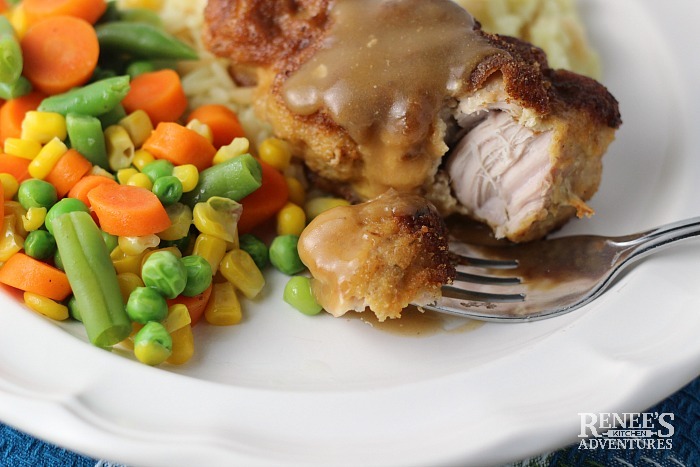 City chicken w/mashed potatoes and gravy is one of my family's favorite meals. I live in Michigan and my mom made city chicken when I was growing up. I always use pork and veal, coat w/flour, then egg wash and then saltine cracker crumbs. I grew up in northern West Virginia and am familiar with city chicken. Can't wait to try this recipe! I am from NE Ohio, and don't know what part of my heritage this dish comes from, but I always thought it was too cool that you could cook pork, and it tastes like the best darn chicken you ever tasted!.... Hence the name. We sprinkle the pork with nutmeg, not paprika.. the rest of this recipe is spot on!! .. and It is more yummy than you would ever think! Oh wow! I love the idea of using nutmeg! I'll have to try that next time! I just made this using your recipe-- the only alteration was I used Shake and Bake and it was AMAZING! My husband just told me it was the best meal I ever made. Thank you for sharing this recipe- I couldn't remember how my mom made it when I was growing up so when I saw your ingredients it looked familiar. I grew up in Ohio and this was a staple while growing up. thanks! Love City Chicken, grew up in Akron, Ohio and this meal was often on our dinner table. Always had it with mashed potatoes and gravy. We love city chicken but without the gravy. Lately mine has been tough though. Is there a way to slow bake it and still have it come out with a crunchy breading? My son doesn't like gravy on his either. I'm not sure if there is away to keep the breading crispy and yet get a tender pork. I get the sensation of comfort just looking at your great recipics! This will definitely be on my to do list this week. Wow, where was my family when this recipe became a Midwestern favorite? Maybe asleep at the wheel! If you say it's delicious, Renee, then I know it must be! Thank you for the foodie education and for sharing! It's regional to the Ohio, PA, and WV areas I think. I hope you give it a try. Great recipe. In the Pennsylvania Coal Region we used a combination of pork, beef and veal. I can not wait to try this recipe. I've definitely heard of the mixed meat variation. I've always had it with just pork, but I need to try it with the three meats sometime. Thanks for dropping by! I grew up in Cleveland Ohio my mother was a wonderful cook and from north Pa. She made this dish when I was growing up and I always loved it.I am 75 and in my younger years made it for my family. So excited to see this article and read your post. My parents passed away in their 90's and I made this for them one Sunday after church. My Dad was thrilled. I made it with a combination of pork and veal. A long time ago it was not so expensive but it is now. Thank you so much for your blog and the ideas. My daughter in law is a blogger and fun to share with these ideas of yours as she is from the north east. I have kept your post to read and re read . Every time I ask people if they have heard of City Chicken they just look at me blankly.Thank you so much. Thank you so much for your lovely comment! I am so honored to have revoked such wonderful memories for you! I'm so glad you enjoyed it. It's one of my family's favorite dinners! City Chicken,I just love it, it's one of the best meats ever. My mom used the crushed saltine crackers instead of breadcrumbs. I am going to try the breadcrumbs tonight, I can't wait, it's been to many years since I've had City Chicken. Thanks for the recipe. I hope you enjoy this recipe as much as the one your mom used to make. It sure is one of our favorite comfort meals. In the process of moving recently, I spotted my mother's old electric frying pan in my stuff (square, olive green) and fond memories of fried pork chops and city chicken flooded back into memory. Growing up in Detroit in the 70's, we had City Chicken often - mostly with beef chunks, pork, actual chicken, and sometimes veal on short, thick skewers. By the way, this is not a Midwestern specialty, so it's no wonder you've not heard of it in Missouri, Nebraska, Iowa, Kansas, or elsewhere - it's indigenous to the Great Lakes region (lower Michigan, upper Ohio, eastern Pennsylvania, eastern new York, and upper West Virginia). After spending a decade in California, where they've never heard of green bean casserole, (! ), my dinner partner for tomorrow is in for a treat, even though veal is hard to come by here in mid-Missouri (I happened upon a slice the other day). Love this story! Thanks for sharing and thanks for stopping by! 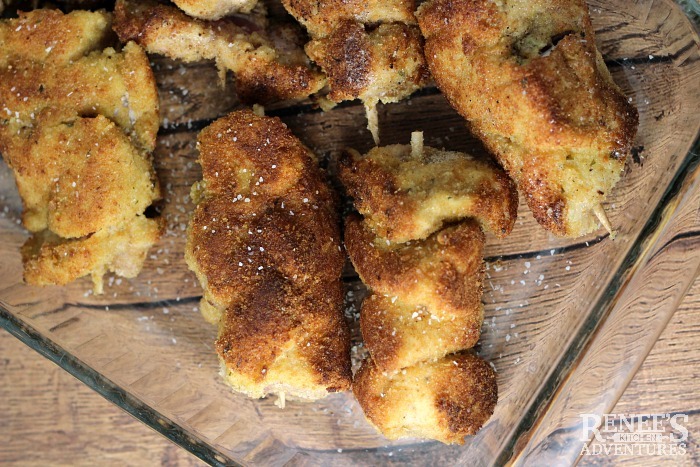 My grandma used to make city chicken...I make it too using pork...but, if I remember correctly she also used veal in hers?...either way, they are sooooooooo good!...thanks for sharing your recipe...going to try the Italian bread crumb mixture...I've only used the plain ones in mine. Hi thanks so much for stopping by. Yes, I've seen recipes with a combination of meats. I think anyway you make it, city chicken is pure comfort food at it's best.